Milcho Manchevski's first feature film is indeed a masterpiece of film making. Bold, lyrical, poetic, humane, intelligent, it is a three-part story of the violence and political chaos tearing apart the newly independent nation of Macedonia (former Yugoslavia). 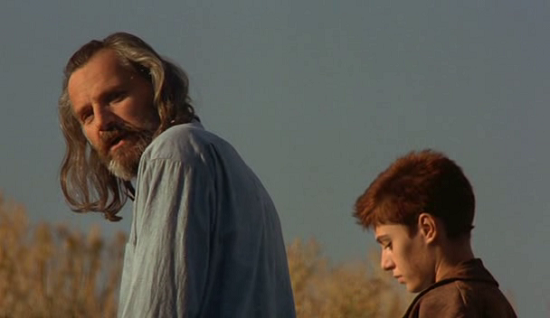 Before the Rain received a 1995 Academy Award nomination as Best Foreign Language Film. The first story thread involves Kiril (Grégoire Colin), a young Christian monk whose vow of silence allows the tale to be told almost entirely through its striking visuals, with mountain locales and ornamentally detailed orthodox churches as an appropriately epic backdrop. The monk provides shelter for an Albanian Muslim refugee named Zamira (Labina Mitevska), keeping her presence secret from his Macedonian elders and placing himself in danger from the roving band of ethnic cleansing gunmen. 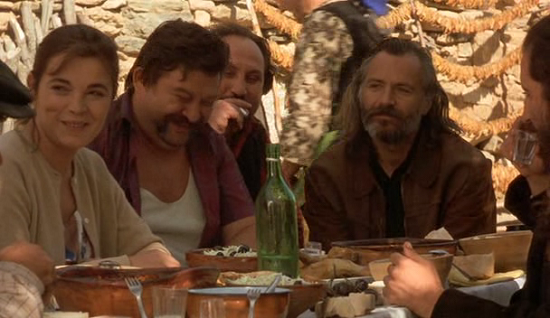 Milcho Manchavski's camera conjures up a sense of macho, testosterone-driven restlessness when he hides the girl. The very title, Before the Rain, signals the idea of an approaching storm, but when it comes down, it will be like a hail of stones. 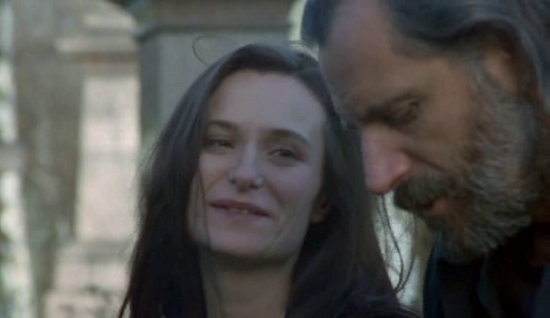 The second segment, set in London, concerns Anne (Katrin Cartlidge), married to stable but boring Nick (Jay Villiers) but enjoying an affair with Macedonian photographer Aleksander (Rade Serbedzija). 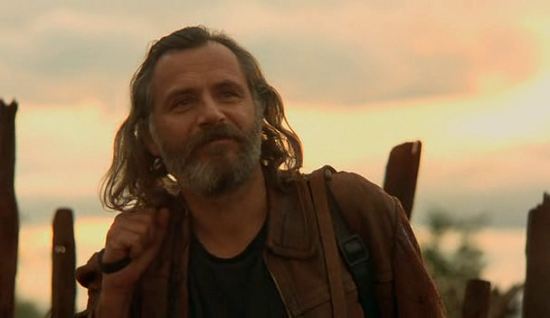 Manchavski's feral masculine energy is entirely poured into the character of her would-be lover Alexsandar (Rade Serbedzija), a wild man of a photojournalist with wild long locks of gray hair and a tangled beard. In self-imposed exile from his homeland Macedonia, he's conflicted about returning to his roots in the name of a righteous cause. He hovers around Anne as if he were a voracious animal, nuzzling her and cooing ironic words of love in an attempt to join him on his adventure, steering her away from her banal yuppie lifestyle. Anne is trying to decide if she should stay with Nick or leave with Aleksander, before unexpected events make the decision for her. The concluding part, which is the longest, follows Aleksander back to Macedonia; while he's tired of photographing war, he finds no sanctuary in his home town, as Christians and Muslims wage war and he accidentally causes the death of innocent bystanders. “Before the Rain” integrates successfully the broader political forces into the protagonists' daily lives. There's a heartbreaking and suspenseful encounter, when Aleksandar visits his old girlfriend, and there's a frightening scene in a chic London restaurant, where Anne and her husband are dining that suddenly turns into a ferocious bloodshed. Violence knows no limits or national boundaries. Manchevski doesn't take sides, and it's refreshing that he doesn't opt for simplistic resolutions that condemn the American politicians or the U.N. “peacekeeping” forces. As writer-director, he's also effective in showing the explosive potential of these conflicts to erupt beyond their geographical borders. Clearly, Manchevski wishes for his region not to go through the pain and horror that the rest of Yugoslavia is still suffering from. But the movie's slick and “artsy” style of the movie, a possible result of the director's music videos background, works against the seriousness of its issues; a simpler visual style would have been more forceful. One never grows tired of watching Before the Rain. It is, first, a stunningly beautiful piece of cinematography. The camera pans natural vistas, churches, London streets, and the faces of the interlocking characters with sensitivity, wisdom, and love. The three parts of the film mesh with perfect paradox, underscoring the recurring theme that time is not a circle. We see the young, the old, the weak, the strong, the living, and the dead all intermingling with an incoherent rap song which blasts from speakers the world over. The pacing is ideal; the plot is ingenious; the message is eternal. Before the Rain should be reissued on videocassette and offered on DVD. It moves me as much as any film I've ever seen. Even American high-school students are captivated by it, and that in itself in a small miracle! One needs to stress the enthralling music in this film. Its dark, dramatic, mysterious, intriguing laments perfectly fit with the film. The music is at once gripping, captivating, alluring, and even dangerous. It intoxicates and transports you to the place and time of the music. Indeed, it is an experience to listen to it. This is the mark of a great soundtrack, I think. One which can be taken outside the context of the film for which it was made and played again and again, still evoking the images of the film (or evoking other, perhaps more powerful feelings). "Time Never Dies" is the circular theme that weaves together all three plots and echoed using poetic images and sounds (characters in different places and even time zones reacting to the same music, same claps of thunder, and so on. The glossy three-part story thus intertwines and leads forward and then back to the beginning story. 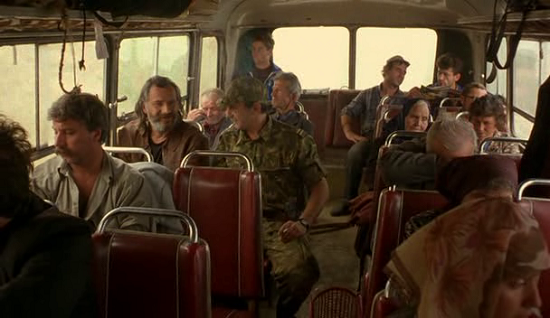 “Before the Rain” shows the beauty of the Macedonian landscape and tells us about the ethnic violence plaguing the newly formed country and how it even reaches to international borders, as the longtime enemies’ war again as a result of the Balkan ethnic cleansing crisis. Manchevski states in a pessimistic solemn way that the current bloody situation has its characters perpetually stuck with an irrational hatred for each other dating from ancient times. The dense riddle it presents says that the region can't change for the better because it's mired in ethnic hatred and as a result "Time never dies, the circle is not round." The director clearly blames no one else but both sides for the current conflict.